CHI St. Alexius Health Great Plains Rehabilitation Services offers a Cranial Remolding Program for infants who have been diagnosed with cranial deformity. Great Plains specializes in cranial helmets utilizing industry leading technology and uses the Gold standard Star Scanner for obtaining 3D images and the Star band family of helmets. 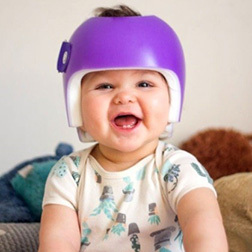 Multiple studies have shown that optimal starting time for cranial helmeting treatment is between four and six months of age. This allows the helmet or orthosis time to produce more effective results during rapid brain growth and pliability of the baby’s head. The Great Plain’s team is committed to obtaining excellent outcomes through cranial helmeting. Parents and caregivers are encouraged to speak with their pediatrician as soon as they notice any irregularity in their babies head shape. For questions regarding cranial molding therapy at CHI St. Alexius Health Great Plains Rehabilitation Services, please call 701.530.4000 to speak with one of our Certified Orthotists, Eric Kilzer or Todd Jasper. They will provide you with more information and/or a free evaluation. The Cranial Remolding Program is covered by many insurance companies. Check with your insurance representative to see if this treatment is covered. We have achieved hundreds of excellent, successful results with our baby helmet graduates!